Today was a travel day. 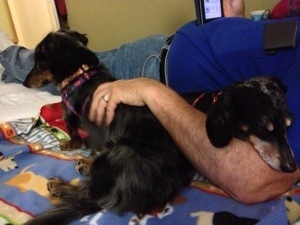 Eleven hours, 504 miles and one emergency pit stop later, we arrived in Kentucky. We left Duncannon around 8 a.m. and hopped on the Pennsylvania Turnpike. Even though it was a fast-moving Interstate, it snaked through some lovely country. Rolling hills, farmland, barns painted with tobacco ads…we saw another bit of Americana. To get to our destination, we crossed three state lines, making the day a four-state extravaganza! 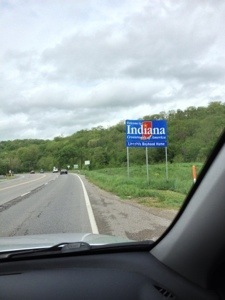 West Virginia was just a blur–we were barely there for fifteen minutes before we catapulted into Ohio. But hey, we got a picture of the Welcome sign. It counts! 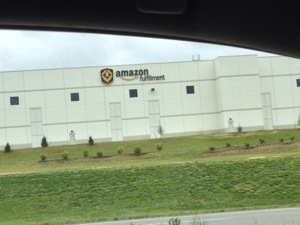 We were about half-way across Ohio, and I was getting a bit weary of large semis and road construction. I suggested that we get off the Interstate and venture on some back roads. We got off at Route 79 and made a stop at Buckeye Lake. Juliet especially enjoyed the stop as she rolled around in goose poop! It was another beautiful day, and we sat in the sun for a few minutes and watched families picnic and a fisherman catch a sizable fish. Then it was off to Route 22 West. Aside: We have been noticing that this driving tour is turning out to be a water tour as well. 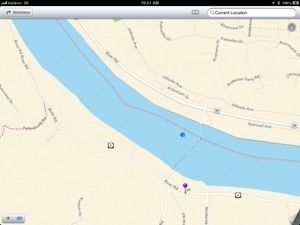 South of Pittsburg, we crossed the Monongahela River. 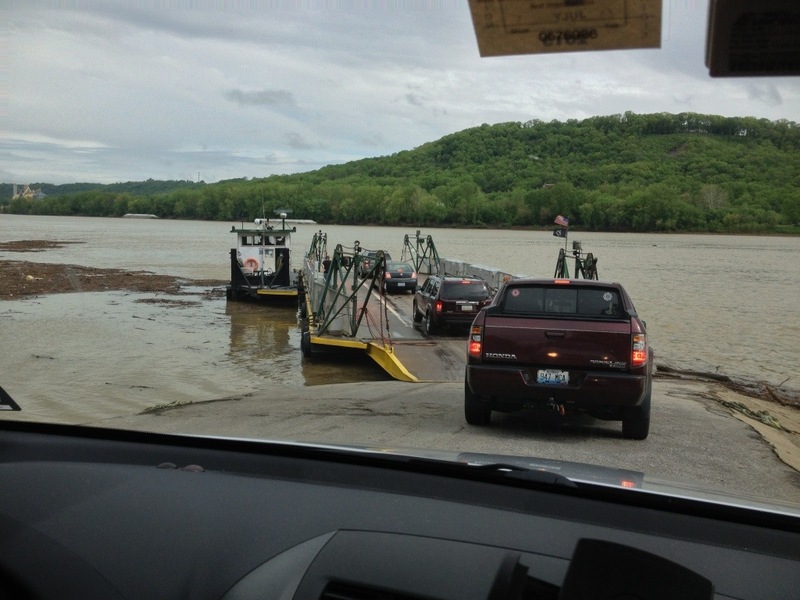 We also crossed the Ohio River (WV border), the Licking River, and the Scioto River (OH). 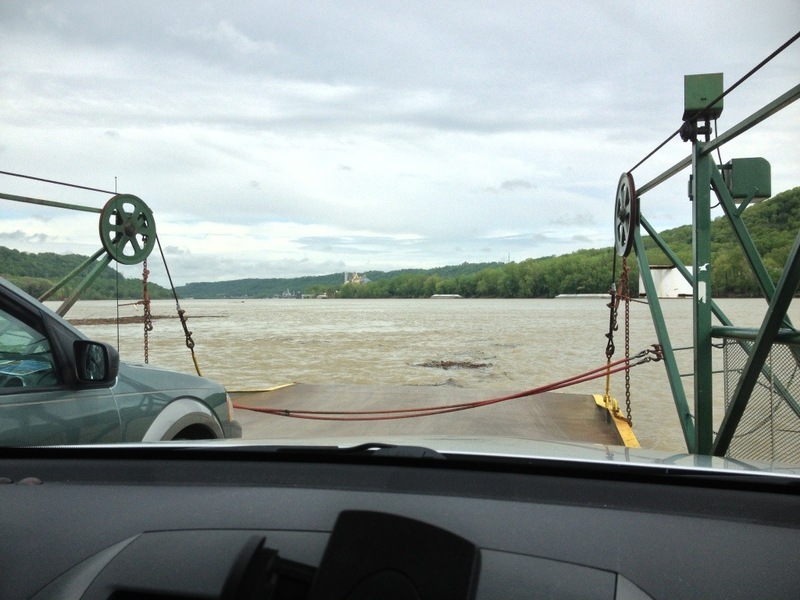 On our way to Duncannon, we were around the Chesapeake Basin, and we criss-crossed the Susquehanna river many times. We went over the East Branch of the Delaware River around the Pepacton Reservoir. We’ll cross the Mississippi, and maybe even the Rio Grande. We drove through Lancaster, Circleville, and on to Wilmington. We were going to take Route 22 all the way to highway 275 near the Ohio/Kentucky border, but Jasmine’s tender stomach required an emergency pit stop, lots of wipes and a very large trash bag. 😦 So we made our way back to the Interstate and motored on to Kentucky. We arrived at our destination around 7 p.m. and were immediately greeted by Minda and Pete, their kids Sam and Grace, and their dog Sparky. You’ll have to wait for the next post to find out what happened next!